“You can call me anytime,” she said over the phone from her ranch in Hurricane Mills, Tennessee. It’s the second time I’ve been lucky enough to talk to Miss Loretta, which is how everyone refers to her, and each time it’s a joy. Unlike other living legends, she goes out of her way to find out about the guy asking the questions, and ends our conversations with promises of more to come. Born in 1932 in Butcher’s Holler, Kentucky, she wrote about the real facts of her life, and turned it into classic song. Songwriters struggle everyday with the old quandary of wanting to write about specifics, but maybe not so specific as to lose your audience. And so some choose to write intentionally vague songs, so as not to exclude or alienate any listener. But time and time again we learn the same lesson. Which is that the most universal songs are the most specific ones. The beauty and undying strength of “Coal Miner’s Daughter” lies in the truth. Every line is true. And there was more, as she related in this story behind the classic song. Yet even those of us who have never been to Butcher’s Holler – or any holler for that matter – can experience the world of her childhood. It’s all there. That is, except the parts she cut out, as related during our talk on the origins of this remarkable song. 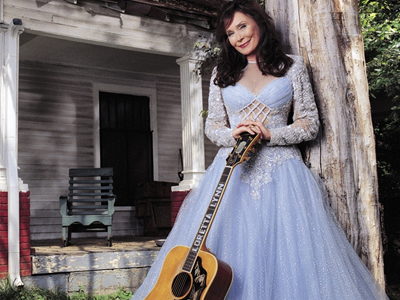 LORETTA LYNN: “I wrote it on a little $17 guitar. It didn’t stay in tune. And $17 was a lot of money, cause at the time we didn’t have any money. But then Gibson gave me a guitar, and I wrote all the others on that one. Every word is true. My daddy would work all night in the coal mine. During the day he would work in the cornfields. There were ten of us. He had to make a living for us. Eight kids. I was second, so I would take care of the kids while Mommy did the sewing and the cleaning and everything else. I think that’s why I sing. I’d rock the babies to sleep and sing to them. The song says Mommy’s fingers were bleeding. I’d seen them bleed many times. In the wintertime we had these old clothes-lines made out of wire. It would be so cold that her fingers would stick to that wire. She’d pull them loose and I’d see the hide come off of those fingers. I would hide and cry. Monday was wash day. She’d scrub on those washboards all day and her fingers would bleed. But she didn’t complain. My Mommy, to me, was beautiful. I’d see everything she’d do, whether it was crying or laughing. She would rock the babies by the coal oil light, like in the song. That was our light. We didn’t have much light. Butcher Holler, Kentucky was dark at night. You go up a long holler, and there’s trees everywhere and it’s very dark. We had a well. I would help my daddy a lot and bring the water in at night when I wasn’t being lazy. [The song] says we’d go without shoes in the summer. We would wear our shoes out before it would be warm enough to be without shoes. We’d have holes in our shoes, and put paste-board in our shoes. But halfway to school the paste-board would come out. One time my daddy found me by the creek with my shoes off, just crying, cause it was so cold from those shoes with holes. And Daddy picked me up and carried me home. And Daddy only weighed 117 pounds. I don’t know how he did it, but he did. You know, you hear about poor people in other countries. There are a lot of poor people in our country if you go to the right places. There are a lot of hollers, not just Butcher Holler. I’ve seen them. I guarantee you there’s kids right to this day in the Kentucky hills that don’t have shoes. There’s the line “Daddy always managed to get the money somewhere.” Parents do what they have to do. Daddy would usually try to get two hogs, one to raise and one to sell. So the other hog would pay for itself. We had a rough life. It was a hard life. Mommy would raise a garden in the summer, and we’d help her. She would can, and I would pick wild blackberries. I would go and pick from morning till night. And Mommy would pack up 100 quarts of blackberries. The song doesn’t tell half of it. If I told the whole story nobody would believe it now anyway. [Producer] Owen Bradley heard me writing it. It had about ten verses, and he said it was too long. He said, “There’s already been an ‘El Paso,’ there didn’t need to be another one.” He knew it was about my life, and he didn’t care about my life and figured nobody else would. So I cut out, I think, four verses. And I cried the whole time. And I have lost those verses, I do not remember them. I wish I did. We cut it in Owen’s studio in his barn. It was my arrangement. I told him exactly how I wanted it, whether I wanted the steel to start it, or the fiddle. Then I sang the song to the band, and said, “This is what we’re gonna do now.” And I sang it live with the band. Just sang, I didn’t play guitar. Just a couple takes at the most. I never did many takes of anything. The more I sing, the worse I get. I like to make it fresh. It was my husband Doo’s idea to put a banjo on it after. He was right. It added so much to the song. None of us could believe it. It was a fun session. I stopped at the store before going to the barn. I’d get a half a roll of bologna cut up, and cheese, bread, onion, potato chips. We made everything fun. I didn’t have a drink but whoever had a drink had a drink. A hillbilly party. I didn’t want my sessions not to be fun. Because if you go into a recording studio and you think you’re a better singer than the boys that’s gonna play behind you, then you better not go. It’s a thing you are feeling and you can sense, and I know the musicians can sense it. 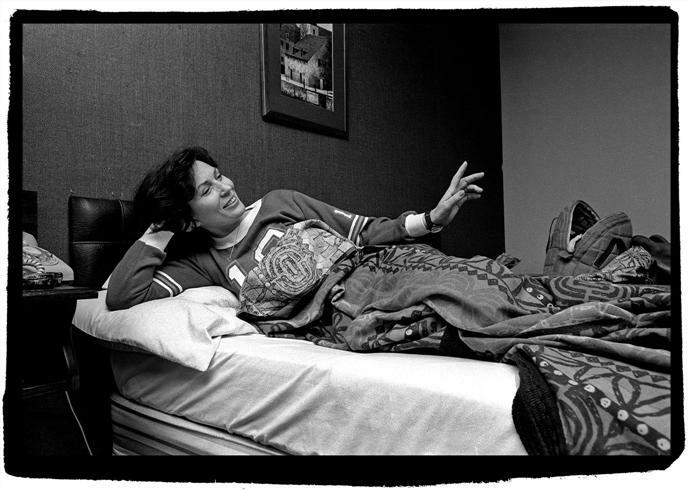 Miss Loretta in Nashville, photo by Stephanie Chernikowski/Morrison Hotel Gallery.